This post is going to be about sausages, and food, and decisions you make as a parent. And it’s probably full of contradictions. But let’s start with something light. What did you eat this weekend? Did you eat out? Did you have takeout? Did you make a meal from scratch? On a typical weekend, I used to shop for groceries and then spent hours in the kitchen cooking. I always considered this very relaxing. It gave me time to unwind and think about stuff. But that was pre-child. These days I am lucky if I can prepare a sandwich without being interrupted. For several reasons there is not much time for quiet and long weekend cooking anymore. The main one is that we try to spend our weekends as a family. We want to go out and do stuff together. And then we get home starving and throw together whatever very quickly. Or we order a pizza. This habit has sneaked into our household since a really wonderful little pizzeria opened in our neighbourhood. They have terrific pizzas, fresh garlic oil, and a vegan cheese option. It’s quick and it’s super convenient. If we do cook, it is not always very relaxing. Having a three year old person running around in your kitchen can sometimes be a little bit nerve-stretching. You have to think about putting the sharp knife away. You probably don’t want to leave your child unattended next to that pot of boiling spaghetti, and so on. And then there is always: “Mum, when is the food ready? When? I am starving! Can we eat already?” But sometimes I think I am getting the hang of it. F knows she cannot touch my knife and most of the time she doesn’t. She wants to take part in our daily activities and she loves to help us cook. She’s taking the tasks I give her super seriously and it’s pretty cute to see her so exited about making her own food. I won’t let her cut stuff just yet, but she can stand on a chair next to the oven and stir vegetables in a pan. She’s often very close to hot pans and steaming water, but so far she hasn’t burnt herself. Once I let her cut some vegetables but that almost gave me a heart attack. I think she needs to learn handling knifes as soon as possible, but until I am ready for that, we’re concentrating on kneading stuff. Especially seitan sausages. All the food we make at home together is vegan food. Although our daughter is not vegan. Compared to me and P, she is growing up very differently. We live in a city, not a village, the food we eat never comes fresh from a farm. The only farms F ever sees are those idealized little fantasy farms in some of her books. I grew up in a village with lots of farmers around me. My grandparents were farmers, too. Many people told me how they saw someone kill and slaughter an animal when they were kids. They even helped to prepare food made from these animals. This often comes up when people argue that killing animals for food is natural. They say that it is important for children to see where their food comes from and I agree. Food production is very often tied to exploitation of both human and non-human animals. We shouldn’t hide that from our children. But what do we do with it? Do we have to agree with it? Do we have to accept it and just shrug our shoulders? Or shouldn’t we teach our child that exploitation is wrong and that we’re not always powerless about it? My daughter knows how “animal based” sausages are made and what the main ingredient in Haribo gummy bears is. But I am also trying to teach her that it doesn’t have to be like this. That we can change things by doing them just a little bit differently. That you can, for example, eat a sausage or a handful of gummy bears without having to accept that it is “normal” to base those foods on dead animals. And still we are not doing everything right. We are not living a perfect vegan life here. We buy stuff and that stuff is way too often based on exploitation. F is not always able to change things because we make other decisions for her. We agreed to raise F vegetarian and not vegan. We’re taking part in animal exploitation. Right now she’s just accepting things as they are. She’s still so small that she’ll base her decisions on what we tell her. She doesn’t eat meat and isn’t tempted to try it. But she does eat dairy although she knows where it comes from. Her father eats these foods too, so of course it’s okay for her. Although she also knows what I think about cow’s milk or cheese. Some people say this is an easy decision. If you want the best for your family, they should all go vegan. Maybe some would even soay I am not a “real” vegan because we have dairy in our house. I don’t think it is so easy though. For this family parenting and living together with others in a household is based on compromises.When I met my partner ages ago I was a vegetarian. He was a meat eater. I accepted his way of life, he accepted mine. When I went vegan years later, P did not judge me, he supported me the best way he could. When I got pregnant it suddenly felt difficult to have all these different lifestyles under one roof. We talked about how to raise our child, and what kind of food to cook. P knew I would not be able or willing to cook meat. So we settled on compromises. P went vegetarian. His compromise. My compromise: raising the child vegetarian, not vegan. At least not in the long run. At least not, if it wasn’t really doable. I am not a stay at home mother, I never wanted to be one. We don’t live in a very vegan friendly environment, at least not when it comes to childcare. Childcare is the main reason why F is not a vegan. Excuses, excuses, you say. Maybe. Being vegan all by myself is easy. But having a family, a job, and other things to do or to decide together often makes these things difficult. We always agreed on sending F to childcare once she would turn one. At that time it was really hard to find something, so there wasn’t much room for being picky. Our applications for a public daycare space was tuned down, so we looked at childminders. Most of them would serve meat almost every day and I felt very queasy about it. I knew I’d have to bring up the food subject. I was sure I would not be able to tolerate having my child eat meat. But I was willing to make some compromises, the compromises we had agree on before. The person who finally became our childminder served meat only once a week. She instantly suggested to make vegetarian food for F on that day. That was more than I had hoped for and I felt grateful. The childminder cooked her own food and fed the kids three times a day. I didn’t want to ask about vegan food and I didn’t. I thought I had already been lucky. And that is how our daughter became a vegetarian. Two years later we applied for a public kindergarten spot. We didn’t get a spot at the daycare we wanted, but we got a spot. I was feeling queasy again. We asked about the food and it tuned out they had a caterer who served meat once per week. The teachers told us to talk to the caterer, maybe they could provide an alternative? They had alternatives for allergy kids and muslims, too. But apparently being vegetarian doesn’t entitle you for an alternative meal. When they refused to provide for our daughter, the kindergarten staff had no objections to homecooked alternatives. And I was willing to provide them. Once a week, I could do that. F is now the only vegetarian kid in a daycare with about 160 to 180 children. I admit that I would feel overwhelmed if I had to provide all of her daycare meals. It’s a relief that she gets fed at daycare. The caterer, although stubborn, is a relief, too. I’ve seen other kindergarten menus, with lots of meat. I know we can always do so much better, it’s not perfect, sure. But it’s a start. And F, unlike many of her friends, knows where her food comes from and what’s it made of. I am trying to explain where eggs and milk come from and why I decided not to eat them, too. For now I am trying to make it about personal decisions although I don’t see veganism that way. If we were a family of vegans I probably could (or would) draw clear borders. Make it about them vs. us. But since we’re not I cannot make it that easy. And maybe that is a good thing, because things are never that easy. Well, you are probably still waiting for that recipe! This is another one F and I made together. It’s currywurst, a popular German fast food and maybe you have heard of it. I’ve made it before, you can find my basic recipe of the blog. It’s a fried sausage (bratwurst) smothered in a sauce that is made from ketchup, spices, and curry powder. For this new version I increased the amount of spices, starting with the sausage itself. And I made the sauce a little bit more interesting by using mango puree. (You can find that at Asian grocery stores.) The sausages can be made spicy or mild, depending on your preferences. For a milder version simply use mild smoked paprika powder instead of the chipotle plus a mild curry powder. If you feel that these don’t have enough spice, use one tablespoon of chipotle and reduce the amount of paprika powder to one teaspoon. Also use hot curry powder and double the amount. Note: This recipe calls for mushroom powder. I got the idea to use dried mushrooms from Vegan Yack Attack’s awesome currywurst recipe. The idea to pulverise them is courtesy of Celine Steen who uses mushroom powder in her latest cookbooks. Whisk together water, oil, and tomato paste and add to dry mix. Knead well until everything is combined. Divide the batter into four pieces and roll each piece into a 15 cm ( 6 inch) long log. 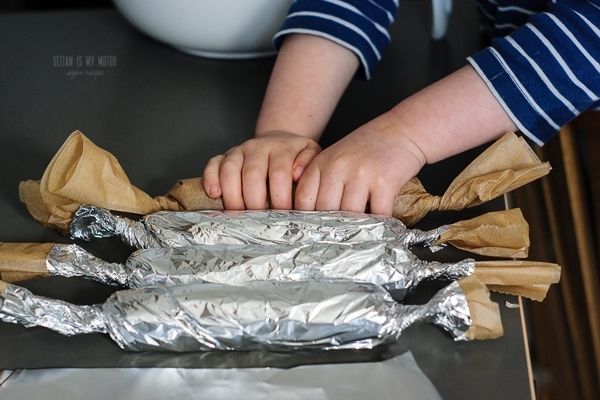 Wrap in parchment and twist the edges, then wrap in foil. Place a steamer basket in a large pot and add water. Bring to a boil and add sausages. Reduce the heat so that the water is simmering and steam the sausges for 50 minutes. Remove and let cool in their packaging. Let the sausages sit in the fridge over night to improve flavour and texture. When ready to serve, whisk together the ingredients for the sauce. Heat a tablespoon of oil in a large pan and cut the sausages into small pieces. Fry for 2-3 minutes on each side, or until crispy. Serve with sauce and fries. *For the mushroom powder simply place one ounce of dried porcini mushrooms in a coffee grinder and pulverise. Store leftovers in a glass jar and use in soups and sauces. I am glad I finally found time to read this (had a few false starts). It is really thoughtful about a difficult subject. I am a vegetarian raising my child vegetarian with an omnivore partner so I relate to some of this. It seems very natural to me and very challenging at times for her to be vegetarian. It is hard having the conversations about meat because she needs to learn how nuanced it is so she does not make others feel uncomfortable about their choices. Yet we need some honesty about our own lifestyle. 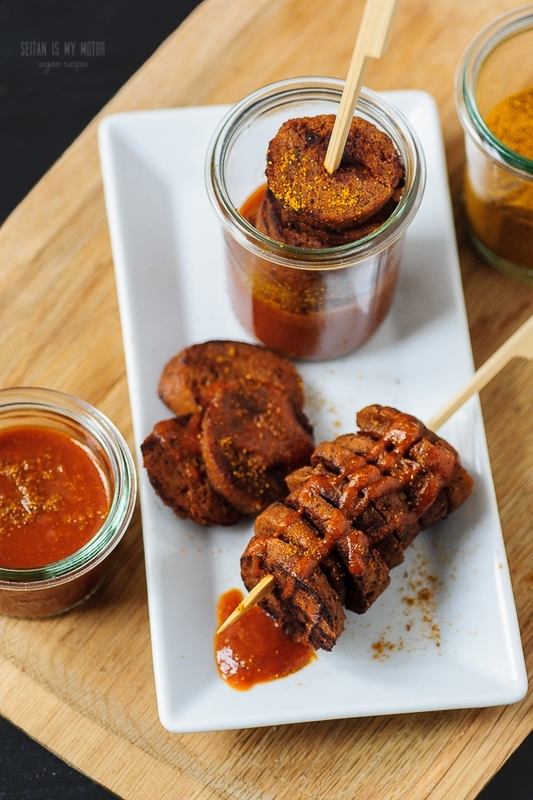 Your currywurst sounds great – I have made this gluten flour sort of sausage before and this makes me want to try it again with your seasonings. The mushroom powder is a great idea. In Germany the dominant public opinion is that you’re harming your child if you raise them vegan. If you raise them vegetarian, many people question your decisions, too. People warn you about deficiencies and never keep in mind that vegan and vegetarian parents usually do a lot more research than omnivore parents. And yes, not only the meat culture in Germany is entrenched. People don’t like difference, especially not where I live. This is an interesting read especially since Sayward from Bonzai Aphrodite did a video about raising her child vegan. I’m a vegan and my husband is mostly vegan (basically only eating meat/dairy/eggs at restaurants and family get togethers) We plan on having kids so the idea of raising my child vegan is a daunting one. Will I let my children eat meat at family get togethers? I think children should be raised to be open to try foods, will telling them not to eat meat and cheese enforce any picky eating tendencies? Will family members feed them non-vegan foods if they babysit them? When they get older will they recent vegan foods and create a love of “forbidden foods”? We live in an area that is pretty vegan friendly, but majority of the population eats a meat and cheese heavy diet. Anyways, I think you are finding some great middle ground with raising your children. I think sometimes people need black and white borders, but honestly marriage and raising children require some compromises. Thanks for mentioning that video, I’ll check it out! My kid seems to be much less picky than the “normal” eaters around her. I also do not approach the foods we don’t eat as forbidden foods. I try to word is as “we don’t eat” rather than “we can’t eat” and I tell my daughter that we don’t eat those foods for moral/ethical reasons. That seems to do the trick and she gets that theoretically she could eat them if she wanted to. I hope that makes sense? danke für das Rezept und überhaupt für alles was Du mit uns teilst. Ich hab ne pratische Frage zu der Kochaktion der Würste: Legst Du die Teile direkt ins Wasser oder kommen die in den Einsatz und haben gar keinen Wasserkontakt? Hallo Heike, die Würste werden im Dampf gegart, haben also keinen Kontakt mit dem Wasser. Wonderful post! I’m not a parent myself, but spend a lot of time trying to be a positive influence for my nieces and nephew while their parents are meat eaters. And this recipe looks simply divine, wow. Thanks! forgot to add, would love to give these sausages a try for sure! Can’t wait! Such a thoughtful post, I find it so interesting that in so many parts of the world dietary restrictions are accommodated due to religion and food intolerances but not ethical/moral choices. Were you tempted to claim a dietary intolerance? At any rate, you sound like an incredibly thoughtful mother. We all have to make decisions that my not be optimal-for example i have to take medication that contains animal hormones for my thyroid. Other alternatives are not an option for me. I think there’s a place for doing the best we can. I know, having lived in Leipzig and now Berlin, that meat is a big part of the Deutsch diet and psyche for many people. I come from Australia originally where of course barbecues and sunday roasts are traditions and I’d like to think it was reasonably progressive to difference living in my greenie left wing bubble but then I see photos of what people are served in Australian hospitals when they ask for a vegan meal and I know I’m wrong. No, I don’t think it’s helpful to lie about these things. I don’t think claiming a food intolerance if you don’t have one is the best way to go. I agree about making non-optimal decisions. Even if a medication is synthetic it for sure has been tested on animals. So in this case I’d always say you do what you have to do to stay healthy. Vielen Dank für die interessanten Einsichten. Mein Freund ist Fleisch, isst allerdings meistens vegan oder wenigstens vegetarisch (so lange wir in berlin sind, zumindest), findet Veganismus allerdings eigentlich richtig. Ich habe damit schon ziemlich starke Probleme. Ich könne mein Kind nicht unvegan ernähren, glaube ich. Allerdings klingt es in deiner Beschreibung nach einem logistischen Albtraum, da man sobald man die “Kontrolle” über das Kind an jemand anderen abgibt solchen Schwierigkeiten ausgesetzt ist. Eine vollkommene Aufopferung deswegen kann kaum (und sollte auch nicht) erwartet werden. Für mich ist die Lösung einfach, denn ich möchte auf keinen Fall Kinder haben. Aber das ist natürlich nur eine persönliche Lösung. Die einzige Lösung die ich sehe ist eher eine gesellschaftliche, aber das kann man natürlich wiederum nicht alleine und nicht auf einen Schlag ändern. Ich hoffe ja auch sehr auf eine gesellschaftliche Lösung. Eigentlich sind die Kindergärten, die vegetarische Ernährung anbieten, ja schon fortschrittlich. Vor ein paar Jahren hätte das ja noch jeder für Kindsmissbrauch gehalten. Ich denke, da wird sich bestimmt noch mehr tun – oder hoffe es. The currywurst and sauce look delicious Mihl!! At some point I’ll enter the world of parenting and I’ve always thought I’ll cross that bridge when I come to it. Having an omnivorous partner as well, I suppose we’ll end up with a very similar arrangement to yours – but we’ll see. You seem to be handling it very gracefully and finding a good balance between everything that there is consider. I really appreciated reading all of your thoughts about this – very grateful that you’re willing to share and I know that other people appreciate it as well. Thank you! I hope you’ll find a solution that works for you when you get there!